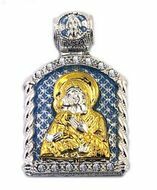 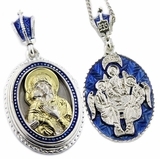 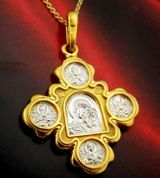 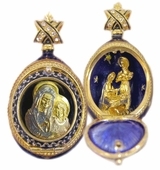 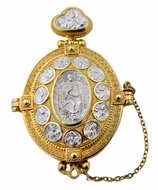 Virgin of Kazan, Reversible Pendant, 1 1/4"
Virgin of Vladimir, Reversible Icon Pendant, 1 1/4"
Virgin Of Kazan, Silver , Gold Plated Pendant, 7/8"
Virgin Mary "Assuage My Sorrows", Icon Pendant. 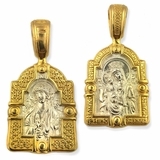 7/8"
Virgin Mary "Sweet Kissing", Two Tone Gold Pendant, 7/8"
Virgin Mary "Sweet Kissing", Two Tones White Gold Pendant, 7/8"
Virgin Mary "Sweet Kissing", Silver /Gold Plated Pendant, 1 1/16"
Arch. 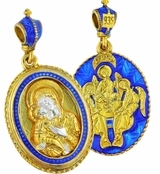 Michael & Guardian Angel Pendant, Small, 1/2"
Holy Trinity/Virgin of the Sign, Pendant, 1"
Sacred Heart of Jesus, Gold Framed Enamel Medal, 1"